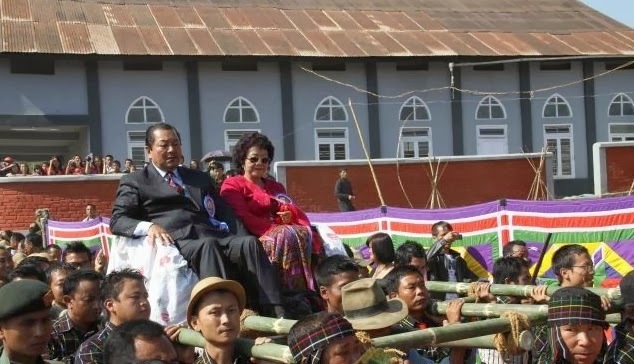 Aizawl, Nov 15 : The ‘royal’ family or ‘Lal Chhungkua,’ as the family of Mizoram Chief Minister and Congress boss Lal Thanhawla is called, has spread its political fold as one more member of the family has bagged a ticket of the party for the forthcoming Assembly election. This brings the number of “family candidates” to five even as two seats have been allotted to the party chief himself. A period of 40 years as the head of the most powerful political party in the State is long enough for any family to expand its wings. The latest entrant into the list of candidates is Chalrosanga Ralte, brother of Sports Minister Zodintluanga. Both Chalrosanga Ralte and Zodintluanga, who are contesting on Congress tickets, are the brothers of Thanhawla’s wife. Thanhawla’s own brother, Lal Thanzara, currently a Parliamentary Secretary assisting the Chief Minister, will contest again from Aizawl N III. Thanhawla himself will contest from two constituencies – Serchhip, which he represents, and Hrangturzo. Another family with close ties with the ‘Lals’ is the family of Lt Col (retd) ZS Zuala who himself represents the Aizawl S II seat. Zuala will contest from the same constituency again. He was a surprise candidate in 2008 as he had no political background. Zuala is the brother-in-law of John Rotluangliana, Speaker of the Mizoram Assembly and also of Lok Sabha member CL Ruala. These two powerful families have no blood ties, but informed sources said that Zuala’s and Thanhawla’s family links date back to their fathers. Indeed, these relationships make Thanhawla a powerful patriarch presiding over one of the most formidable political dynasties in India. During the previous years, the Lal Chhungkua factor did not receive much attention. For this election, however, the family network has become a hot topic of discussion on several Mizo social media sites. It all gained momentum when a Congress ticket was given to Chalrosanga. Due to the “wild-card candidature” of Dr Lalmalsawma, a political novice, the grapevine is working overtime even within the closed Congress circles. Son of a noted Mizo evangelist from Shillong, businessman Lalmalsawma has been given the Congress ticket by surpassing other aspirants. “Power and wealth are concentrated in a single network comprising close families and I really do not know how it will do any good to promoting democratic values,” said Muana, a professor teaching in one of the colleges here. Thanhawla, the patriarch of the family, has been a pivotal figure in Mizoram politics. In the schism between two Congress factions at the Centre in the early 1970s, he sided with the Indian National Congress led by Indira Gandhi. He has been the president of the State Congress since 1973. He has been the Chief Minister for nearly 20 years. The elitist family aura has received further embellishment by the change of his name from the simple Mizo spelling, ‘Lalthanhawla’ to ‘Lal Thanhawla,’ the second spelling indicating to the simple rural Mizo mind, a ‘chief’ or ‘king.’ The ‘Lal’ has been separated from their names by his spouse, Lalriliani, and his politician brother. A name or title can play many tricks as is evident from what many Mizos believe about the original Congress dynasty at the Centre, the Gandhis. Congress party sources, however, played this down by explaining that Mizos having single names in their certificates have often had to break their names into two to fill up passport forms which demand first name, middle name and surname. “There is no conspiracy or megalomania behind this. It is just a matter of convenience,” they maintained.